Meir Schneider Self- Healing Method was introduced in Portugal in 2000, great press support; and from then onwards, in Portugal as well as in Brazil, natural vision improvement and my work have been subject in different articles in the printed press as well as in radio and TV interviews happening regularly, along the years. Being always available to the press has been very gratifying especially for all those who are interested in improving their vision and quality of life. Teleshop Group created recently in Brazil a self-assessment tool to help older adults and those with chronic medical conditions to attend when they need a medical alert service. Based on highly reliable technological systems, this tele - assistance service uses specialized attendants to answer immediately to needs of subscribers, allowing for a much safer and independent way of life. Part of the services is an excellent magazine called ACTIVITY, with specialized articles on subjects related to more quality of life for its subscribers. 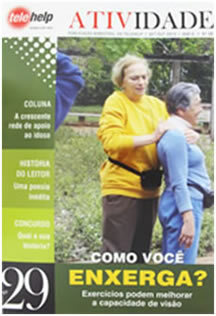 Deana Guimarães is the producer of the magazine and in the edition 29, she recommended an article on our outdoors vision and body exercises in Parks in São Paulo. A great response indeed! If you live in Brazil, you should check www.telehelp.com.br. 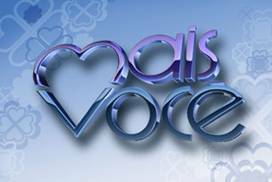 During 2009 and 2010, Brazilians as well as other Portuguese language people expanded their horizons and discovered natural vision improvement thanks to the fantastic opportunity of being invited to present my holistic vision work in four different appearances in programs at the most prestigious and audience leaders on TV in Brazil. 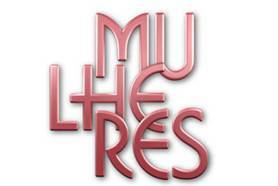 Just to mention two: Mais Voce, at TV Globo, with Ana Maria Braga and Mulheres with Catia Fonseca, at TV Gazeta, both channels covering globally about 17 million people (77% women and 23% men). In 2009, my main concern was discovering how to prevent vision problems in children at the basic education level and I got a great help from these interviews: from June to September, I reached directly more fathers, mothers, grandparents and other family members than by approaching and training about 1.500 school teachers and school management in São Paulo. The opportunities created by these programs where incredible: in just four months about 12 thousand e-mails and phone-calls were answered personally. No doubt that William Bates pioneer work and Meir Schneider’s Self-Healing Method were open even more to the general Brazilian public but the most important was passing a very strong word and optimism about visual education and its results available to all interested. We opened many doors all over the world where the Portuguese language is used. Instantly! February 2011 I was interviewed during the Morning Program, by RedeTV! – Brazil, with great impact from viewers. Access to TV programs and Internet is increasing significantly and these personal contacts and work are reaching viewers from around the world, and more time is being used to develop Internet TV programs and videos for Youtube. Please visit www.youtube.com, use key words Sylvia Lakeland, vision exercises,” exercicios de visao “and even 22nd International Conference for Holistic Vision. Enjoy!